In this session, you will find product reviews and recommendations as well as news and updates on new Electric RC Helicopters product releases. As the technologies of Electric RC Helicopters are progressing at an amazing rate, it is not surprising that new products are released very often. Electric RC Helicopters are becoming all the rage. 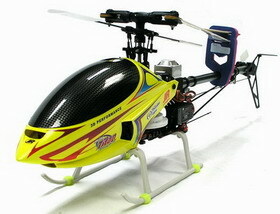 Keeping up with the trend, many RC giants have started producing electric helicopter models of their own. Finally, one of the biggest manufacturer, Thunder Tiger, is entering the arena. Having been so successful that their previous line, the "Raptors", have set a standard in nitro helicopters, it is exciting to see weather their new model, the "Mini Titan E325" can do the same for electric helicopters. One of Align’s main competitors E-Sky, currently introduced their latest model: the Belt CP. A 450-size electric helicopter which rivals the Align TREX 450XL and the Fully loaded Belt-CP that is categorized to match Align’s TREX 450SE. From the production line of GAUI, maker of many successful models such as the Zoom and the Shogun, comes another model to fill the void in the big electric helicopter market: the Hurricane 550. With a much lower price, the Hurricane 550 will undoubtedly provide pilots who want to try their hands on a big electric model helicopter with a promising alternative. Of all the Electric RC Helicopters that are emerging, one product line truly stands out in terms of design. Its features truly do away with most traditional RC helicopter conventions. This model is none other than Taiwan based Gazaur's Mars and Poseidon electric RC helicopters. Let's find out weather these trendy helicopters perform as good as they look.